Home Products Blog Laser Cutting Acrylic is On the Menu! Here on the Vector & Raster blog, we like to give you a taste of everything we have on offer. From laser cutting acrylic to laser cutting wood, there’s going to be a laser cutting service to suit any palate, and our blogs hopefully leave you hungry for more. While the food puns may be getting a little flavourless at this point, they definitely suit the topic for today. 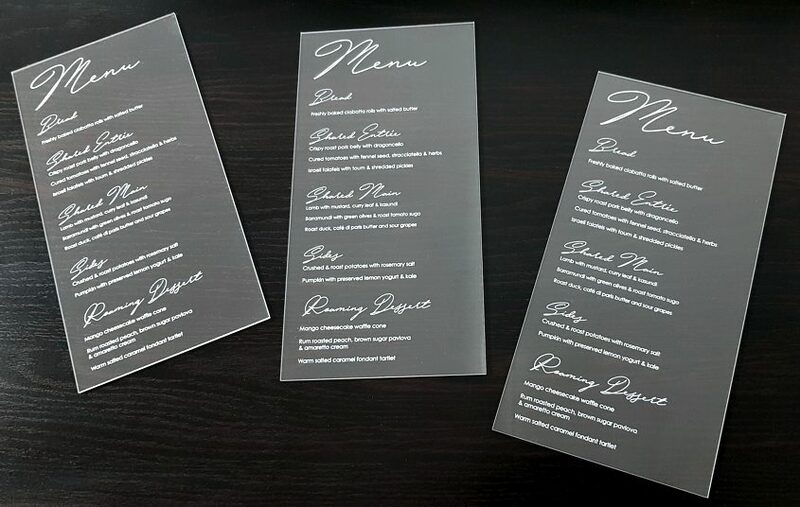 In recent years, laser cutting acrylic into beautifully ornate menus has been hugely popular in the bars, clubs, and restaurants of Melbourne, and it’s easy to see why. These menus act as both a novel way to provide a list of food and beverage options and as a beautiful centrepiece to any table. However, we’re getting ahead of ourselves. At Vector & Raster, we have provided a variety of projects that involve laser cutting acrylic for a wide array of businesses and designers. So, before you decide to place your order, let’s take a look at why laser cutting acrylic is a perfect choice for high-quality menus! Why Should I Consider Laser Cutting Acrylic? Acrylic is one of the most popular materials for laser cutting, and there’s many reasons for that. For one, it’s incredibly easy to work with, allowing for more intricate designs and finer details without as much of a concern about melting or burning. With that said, it’s still important that you work with an experienced laser cutter, as blemishes and imperfections can still occur if mishandled. This versatility allows for a near-limitless number of designs, shapes, and sizes. As we discussed in our Halloween laser cutting article, this can include glossy, satin, or frost finishes, and can be used to create some creepily cute decorations while you’re at it! However, we’re not here to talk about the creepy potential of acrylic, unless of course your bar has a very particular aesthetic. We can talk about the virtues of acrylic all day, but it only takes one look at these beautifully-designed menus to see why people gravitate towards it. These 3mm clear acrylic menus have been laser cut and etched, giving off the appearance of glass while still maintaining the durability of plastic. The etching has a clean, frosty white contrast, which adds to the glassy, classy look. As mentioned earlier, laser cutting acrylic has become hugely popular in cafes, bars, and restaurants, and this should hopefully give a clearer picture as to why that is. Laser cut acrylic allows you to fine-tune your menu designs to perfectly suit your surroundings, allowing them to be eye-catching, while still maintaining visual consistency. As a matter of fact, depending on your preferences, menus can be made out of a variety of materials. Whatever it is you’re looking to achieve with your menu designs, we have the experience and top-of-the-line technology to make it happen. At Vector & Raster, we are dedicated to providing high-quality laser cutting services regardless of material. So, if you’re looking for a fast way to turn your visions into a reality, we’re here to help. For more information, contact us today, and see how laser cutting can transform your next project!